I’m hard at work crocheting a bunch of baby squares, but I had to pop in to show off the pretty package I received today — it’s from the Holiday Swap group on Ravelry. 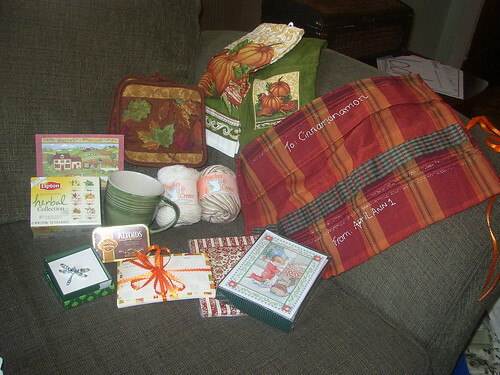 Pretty dishtowels, pot holders, recipe cards, all in my favorite fall colors. A lovely dragonfly pin (I love dragonflies!! ), coordinating peaches & cream yarn (which is hilarious because I sent her coordinating sugar n cream yarn), tea & teacup, a dishcloths pattern book (not pictured as I’d been paging through it in another room), notepaper, Christmas cards, flash cards & coloring books for the boys (already in use at the time of the photo), yummy chocolate dipped ginger mints, and a wonderful needle holder — embroidered with my ravelry name & hers! Thank you so much April! Wool of the Andes yarn in my “clan” colors, stitch markers, a beaded book thong, chocolate, an abacus bracelet, a candle (with the brand name “jamie & clair” — the two main characters in the series), a plaid “rag” bag, a nifty hat pattern, a little knitting/reading light, a jar of huckleberry jam, and a pair of lovely fingerless mitts. By all rights, I should take some “action” shots — almost everything has already been pressed into service (or consumed, lol). OY! Did I tell you? I had a big birthday today. A big one. I haven’t had a “big one” since I turned 21; so you can probably guess what this one was (well, the blog title may give you a wee hint, as well). It seems this birthday deserves a bit of introspection. So where am I in my life? What do I have? What did I think I would have accomplished by now? What yarn did I buy with my birthday money? How many gray hairs do I have? Where am I? I’m in what I believe will be the hardest part of my life — for me, at least. I always planned to do exactly what I’m doing — stay home & raise my children. But these young years really take it out of me. I feel every screech & squeal & worry about every step, word, action. I read books about children being misunderstood as children & shooting out schools as teenagers. I’m dumbfounded when they do mean & angry things, and saddened when I cannot give them everything their heart desires…even when I see the negative impact such indulgence has. What do I have? I have three children so beautiful — of heart, mind & soul — that my own heart aches. I have a wonderfully lighthearted husband, who is, as the best man at our wedding said, the yang to my yin (if I have my reference correct). We are opposites in many ways, and he is at times very frustratingly male; at other times, however, he is so wonderfully male. We just work together, you know? I also have fantastic friends, who spent the day with me today (and brought me some great gifts — the cookies are almost gone, Holly!). One of my friends, Jaimee, actually flew up from Florida with her youngest son, and surprised me! I totally screamed like a girl when I realized what (who) I was seeing (her, standing behind me in the middle of the play area at the mall, where Tim told me to meet him after work). 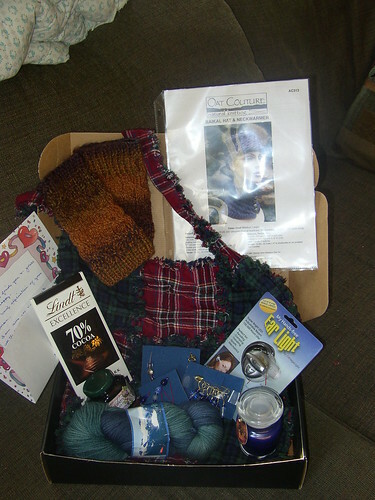 So, what yarn did I buy with my birthday money? Well, I bought Sock yarn! 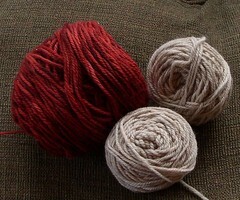 Yummy Misti Alpaca sock yarn that’s soft & light & warm. And at Michaels today I bought Patons Stretch cotton yarn — because I want to knit some stretchy cotton (never mind that I already have Panda cotton…it makes total sense to buy more of a yarn you want to try knitting with, because if it eventually overtakes your stash, it will have to be chosen, right? And I was so geeked to see sock yarn at a big box store, I wanted to encourage it. 🙂 I also picked up a bunch of pretty buttons for sweaters I’ve yet to knit, a fiction knitting book, a knitting booklet, and several pretty wicker baskets for my yarn! 🙂 I have just enough left to order several skeins of peace fleece from the coop I’m running (how sad would I have felt if I’d have had to order a huge pile of yarn & not gotten to keep any of it!). How many gray hairs do I have? None of your business! P.P.P.S. Did I tell you this Misti Alpaca even smells yummy?! I’m conflicted — help! I’ve started a project with this red(dish) and was considering bringing in this contrasting tan. So, is it hip, modern, whatever (is there some rule that states if you have to ask if something is “hip” you are most certainly NOT? Now I feel old…we won’t discuss my upcoming birthday… lol). Tell me the truth — is the red too brown to have this tan paired with it (I’m not certain how well the tan photographed — it’s the darker of the yarns I held double stranded in this photo)? Does it look washed out and ucky? Would you wear it? Ugh. I hate it when I can’t figure things like this out. Help! I’m keeping busy with dh running off on business trips (seems like there have been a few recently), knitting prizes & gifts for swaps left and right (I finally found a color & project I think will make Peaknit smile). I’m pathetically happy that I made it to the post office to mail my two ravelry swaps, and even more proud that I didn’t duct tape my children’s mouths closed at the grocery store when they were acting out every cliched “brat” scenerio I’d ever heard of. *sighs* I’m going to have to stop shopping at that Kroger or I’m going to be pointed at as the lady with the little terrors… Or maybe I should stop taking them shopping when they’re already hungry & cranky? This is a HUGE hint for my husband (who should really read my blog occasionally, grrr). 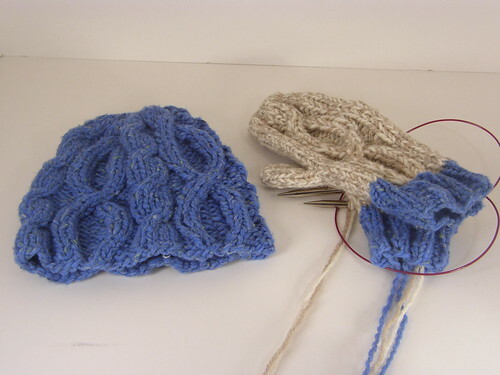 Speaking of my husband, he sent me a link to this ghoulish knit projects page. 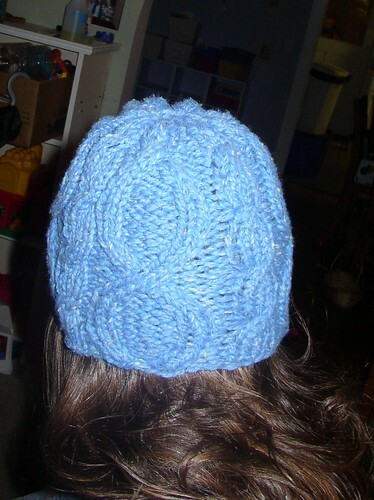 And speaking of ghoulish knits, the Knitty surprises came out a week or two ago. My fav is the Frankensocks. you may even call it…Unoriginal! 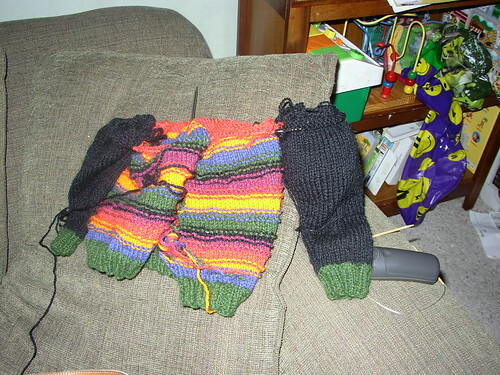 and I’ve started a scarf (although I’m going to have to pull it out — again — this is attempt #3) to match. I’m having to work around severe yarn restrictions — I’m about out of blue. The cream color you see is actually 2 strands held together. 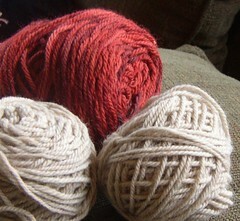 One is a tan/khaki Patons classic merino, and the other is undyed BFL. 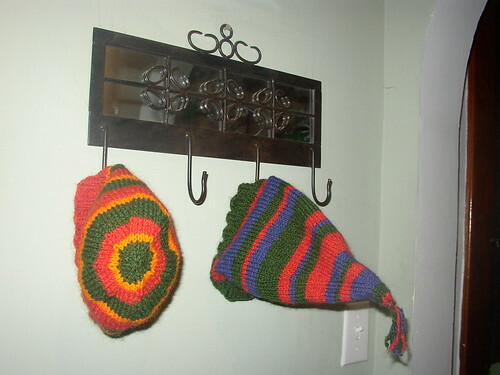 It’s nice to have such a quick project — I did the hat on Monday & Tuesday, one mitten Wednesday, and finished up the 2nd today. Can I knit a scarf in a day? 20 sts. on 10 1/2’s? We’ll see. This set is for my husband’s Grandma. She’s coming up from Florida the week before Thanksgiving & I want to mail this out to her asap so she doesn’t buy something else (but I want it to be a surprise, lol). Back to the needles! How ’bout that election, by the way… 😉 I’m happy, hopeful, and impatient. Please don’t let us down, President (elect) Obama. It sounds silly, but it’s an issue for me. Once I start something, my problem isn’t giving up, it’s allowing myself to admit it isn’t working & having the “guts” to quit. 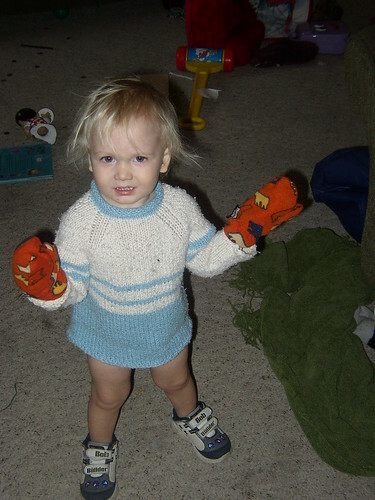 So I now present you with the already riiiiipped cardi for Aiden. I’m still planning to knit them all sweaters, but I think I’m going to go a different direction (which will not include letting them choose multiple colors…lol).